Persian gardens are often cited in contemporary literature as places for pleasure and joy, although in reality, they functioned as dynamic parts of cities and empires. Historical accounts and chronicles as well as the Europeans’ travelogues, written between the 11th and 15th centuries, indicate that Persian gardens played a crucial role as the main context for social and political events. The fragmented but frequent references to gardens in these documents indicate that medieval gardens were usually conceived as flexible territories that could accommodate various functions or modify over time. They served as vibrant settings not only for restoration but also for social and political affairs. This phenomenon originated from the nomadic lifestyle of the majority of rulers in this region who rarely settled down in one area. This lecture addresses the patronage behind gardens of medieval Persia as well as their dynamic functionality as sites for pilgrimage, encampment and administrative affairs. Mohammad Gharipour is Associate Professor at the School of Architecture and Planning at Morgan State University in Baltimore, USA. He obtained his MA in architecture from the University of Tehran and his PhD in architecture and landscape history at Georgia Institute of Technology. Gharipour is the director and founding editor of the International Journal of Islamic Architecture and publishes extensively on architectural history. He has authored and edited several books including Persian Gardens and Pavilions: Reflections in Poetry, Arts and History (I.B. Tauris, 2013). Please note this event will be filmed. 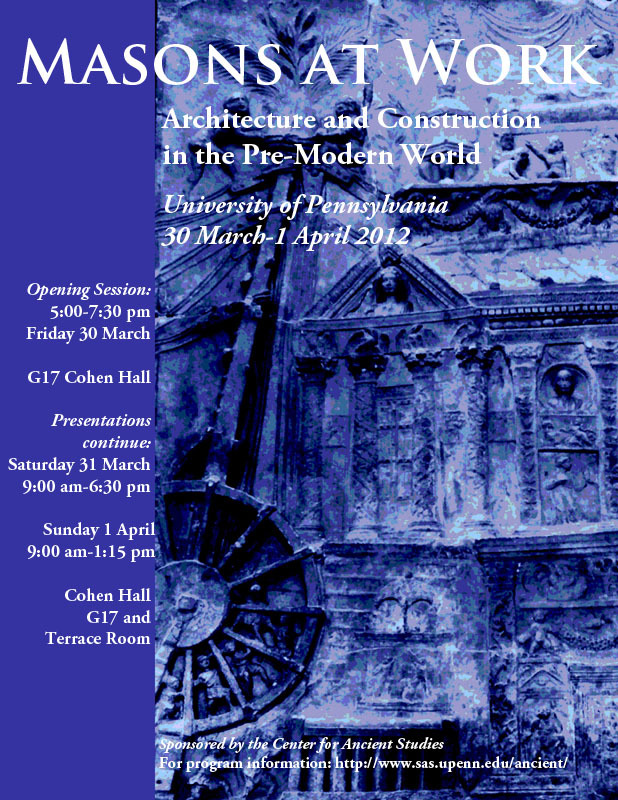 Following on the success of “Masons at Work” (held in spring 2012, and published as http://www.sas.upenn.edu/ancient/publications.html), the symposium will gather specialists to examine building practices in the pre-industrial world, with an emphasis on Greek, Roman, Byzantine, medieval, and pre-modern Islamic architecture. Building practices will be considered in a variety of ways: examining regional and local trends, considering specific architectonic forms, practices of construction, cultural interaction, and wider considerations of the built landscape and change over the longue durée. This program is made possible by The Center for Ancient Studies, University of Pennsylvania, The Department of the History of Art, University of Pennsylvania, and a grant from the Mellon Cross-Cultural Conference Grant Program.